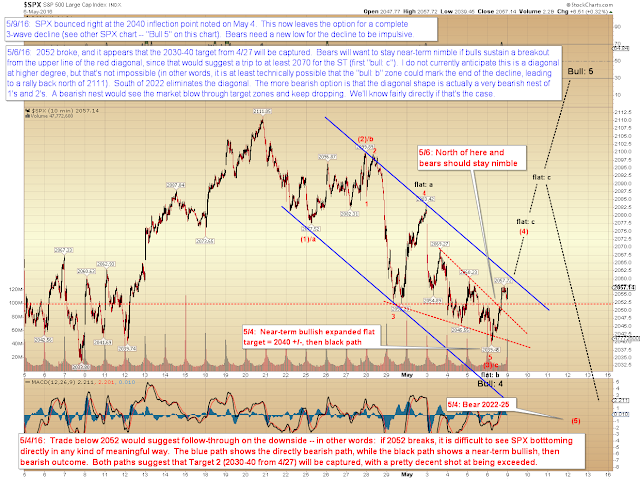 The last couple updates suggested that Target 2 (2030-40) from April 27 was "a given," and that target was indeed captured on Friday. 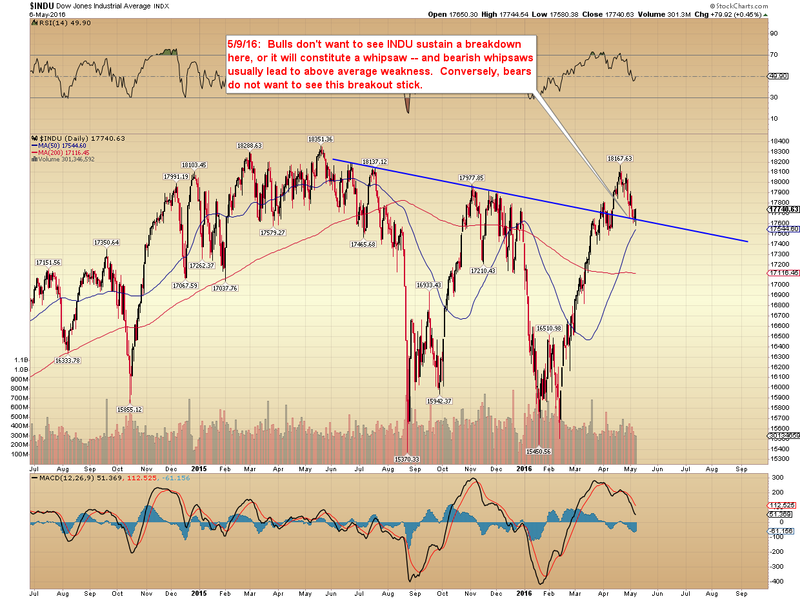 Further, SPX bounced directly off the 2040 level that was noted as an inflection point back on May 4. 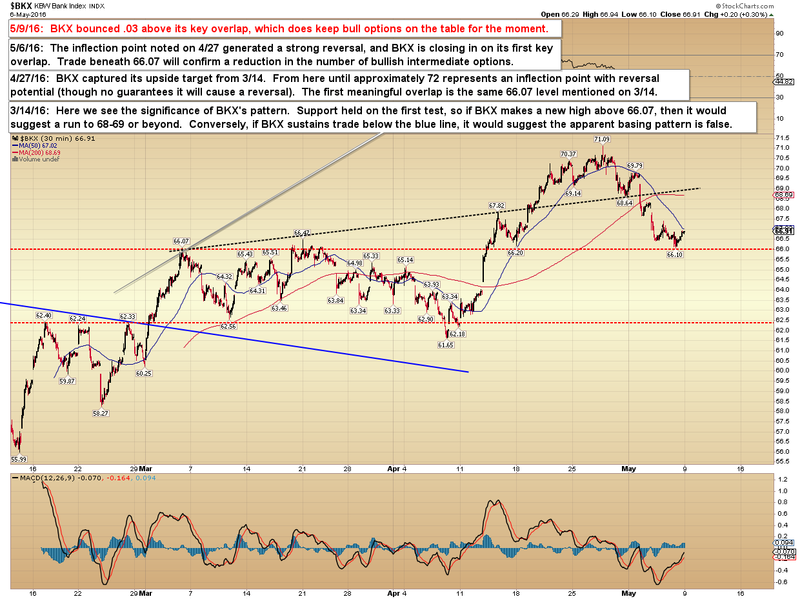 And, additionally, BKX has so far held its key overlap. 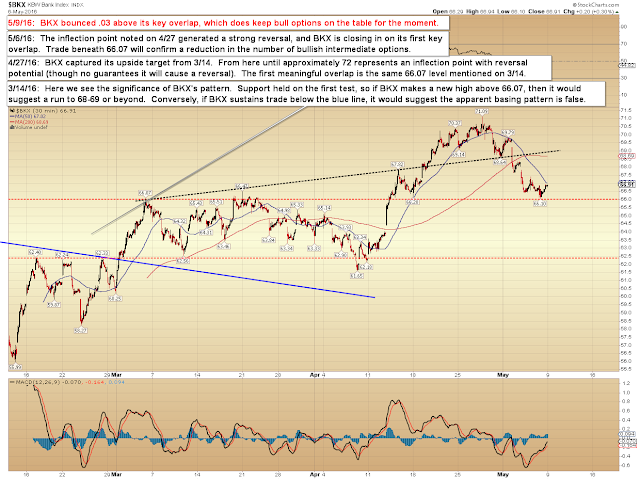 This does at least open the possibility of a completed ABC decline, so for the moment, we have to respect that from a technical perspective. In conclusion, both of my preferred near-term target zones from April 27 were captured, and SPX bounced within pennies of the noted 2040 price point. the next few sessions will likely answer the lingering question as to whether ALL OF C is complete or not. But so far, we don't quite have a "break," meaning the question above is still unanswered, and bulls have kept their options alive from a technical perspective. 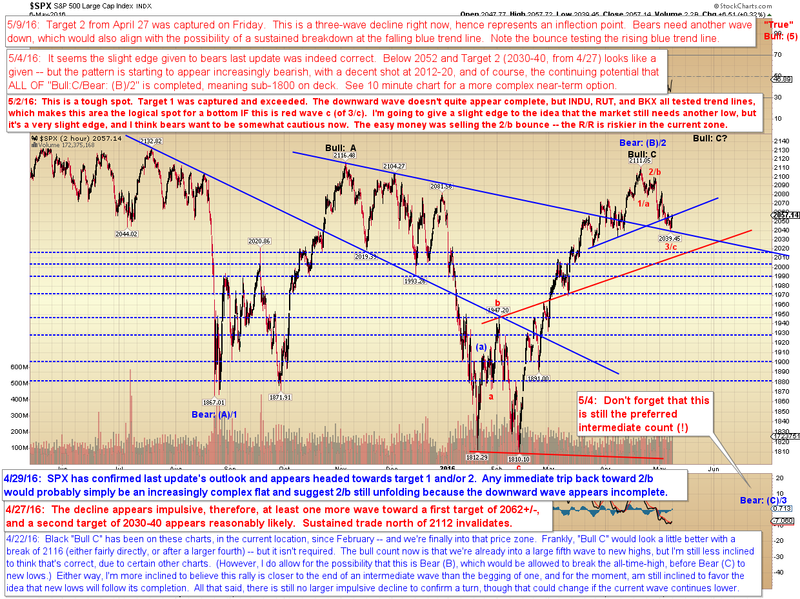 We could have a definitive answer soon, but bears do need to keep in mind the the market has captured my downside target zones -- so we have to look at the charts again and see what's there now. Meaning, we have to observe what has happened in a real sense -- and what has not happened. What has not happened is a key overlap in any index. 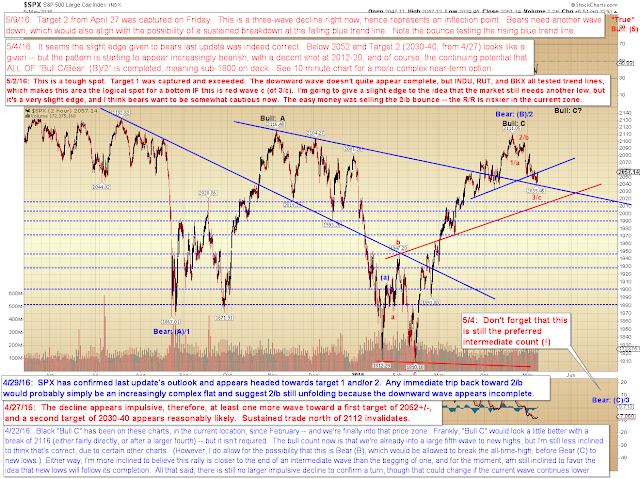 What has happened is that we captured my near-term bearish targets. Intermediate term, I have been reserving judgment until the market answered the question of whether ALL OF C is complete, via a key overlap. It has not answered that question yet, so bears still need breaks of the key levels for confirmation of the intermediate bear case. Again, we have to see what's there in the charts -- not what we hope to see, not what we want to see, not what we think we might see in the future -- but what has actually happened so far. We can't anticipate the future unless we are able to genuinely see the present. 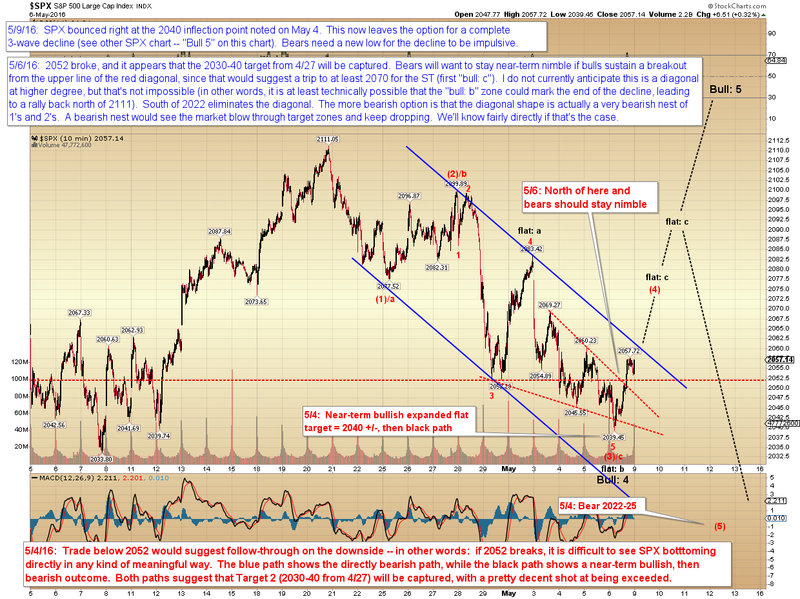 Seeing the charts clearly is what allowed us to capture roughly 60 points of downside profit. That said, I am very, very slightly inclined to think that bears aren't done, but I have to respect the price action above all -- and without key overlaps, there are simply no intermediate assumptions to be garnered from the recent price action. 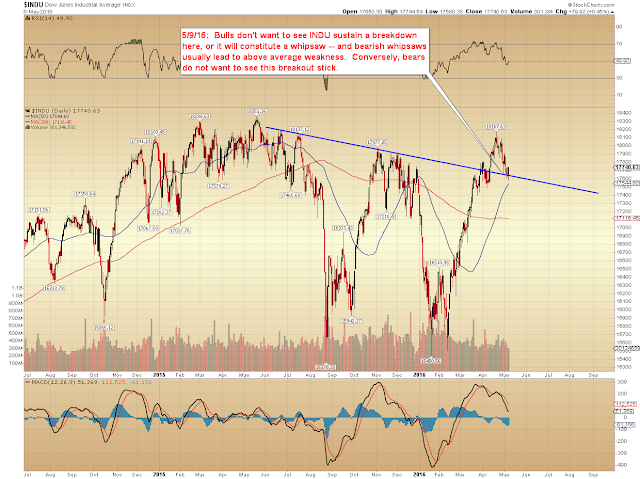 Thus, personally, I would only take very low risk entries heading forward if attempting any short trades. Trade safe.